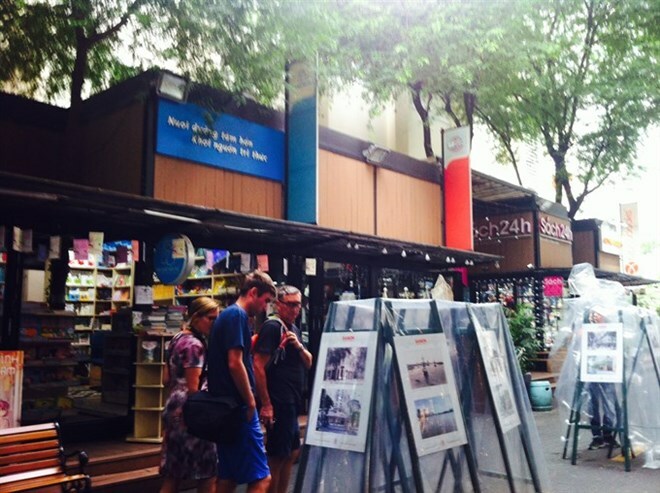 HCM City (VNA) - More than 40 black-and-white and colour photos featuring Saigon and its history are on display at Book Street (Nguyen Van Binh Street) in HCM City’s District 1. The photos are from collections of photographers and collectors Phuc Tien, Van Phung, Hieu Minh and Soh Weng Yew. The photos of the city’s culture and lifestyle include images of old buildings, churches and markets. “The photos are about Saigon and its people, who have worked hard to develop their land,” said Nguyen Thai Bao, who visited the showcase last weekend. “I enjoyed the photos of the Notre Dame Cathedral and Ben Thanh Market, two of the city’s most famous tourist destinations. These buildings are part of our daily life,” she said. Notre Dame Cathedral, designed by French architect Jules Bourard, opened in 1880. All of the building’s materials were imported from France, including the red bricks from Marseille that make up the outside walls which still retain their colour. Ben Thanh Market began as a small market of street vendors near the Ben Nghe River in the early 17th century. In 1859, it was established by the French colonialists after they took over Gia Dinh Citadel. In 1912, the market was moved to a new building on a land of more than 13,000sq.m located in District 1, where it still stands. The market includes 3,000 stalls offering Vietnamese items, including food, garments, shoes and handicrafts. For decades, both the church and the market have attracted hundreds of local residents and foreign tourists each day. “The images of the cathedral at the exhibition help us learn more about the church’s history and the city’s development,” said Rob Matthews, an American visitor. The cathedral is now closed for its first renovation.